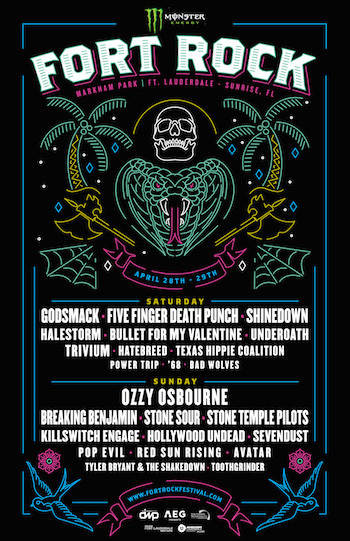 Ozzy Osbourne, Godsmack, Five Finger Death Punch, Stone Sour, Shinedown, and Breaking Benjamin lead a powerful talent lineup for the 6th annual Monster Energy Fort Rock, Saturday, April 28 and Sunday, April 29, 2018. Monster Energy Fort Rock moves to its new home at Markham Park in Sunrise, Florida, in greater Fort Lauderdale, expanding its capacity and providing an enhanced festival experience. In association with the Greater Fort Lauderdale Convention and Visitors Bureau's Hello Sunny Underground Music program, South Florida's Biggest Rock Experience features rock's top artists performing on two stages during the 2-day festival. Godsmack's Shannon Larkin exclaims, "Hey Ft. Lauderdale! It's Shannon from Godsmack, here to announce the band's return to Fort Rock on April 28th. It's been a couple years since we've played in Florida, and 3 out of 4 of us call the Sunshine State our home, so we are STOKED to jam with all our homies and all the great rock fans that have supported us for 20 years! Get ready to get Smacked!!" Clay Busch, Vice President of Marketing and Sponsorship for festival co-producers Danny Wimmer Presents said, "Monster Energy Fort Rock is moving to its new home at Markham Park in Sunrise / Fort Lauderdale for its sixth year, as the site provides a larger space and room to grow, which will allow us to provide attendees with a bigger Fort Rock experience. We truly appreciate the support shown by Fort Rockers over the past five years, and encourage fans in the Fort Myers / Naples area to join us again in 2018 just across 'Alligator Alley'." "Heavy metal music is loved the world over," says John Valentino, Senior Vice President, AEG Presents Southeast. "Its appeal is global and it has no boundaries. We welcome fans of all cultures to come rock with us in Fort Rock's new home at Markham Park." Noelle Stevenson, Vice President, Film, Music, Entertainment & Creative Industries for the Greater Fort Lauderdale Convention and Visitors Bureau said, "We are thrilled to welcome Fort Rock to Broward County, FL. We look forward to our long term partnership with the festival as part of our Hello Sunny's Underground Music program." Go to https://www.sunny.org and www.sunny.org/underground for more information on Hello Sunny. "We look forward to welcoming visitors from all walks of life to experience Fort Rock and are excited to host this amazing event," said Stacy Ritter, CEO, Greater Fort Lauderdale Convention and Visitors Bureau.